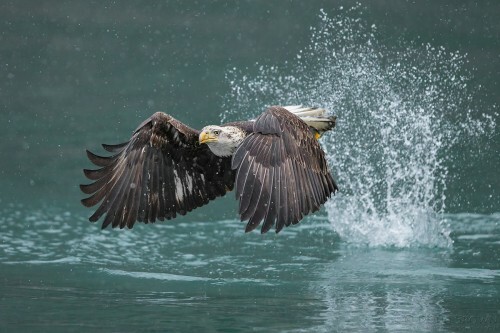 Bioaccumulation: A Lesson from the Peregrine Falcon /Hawks Aloft Inc. 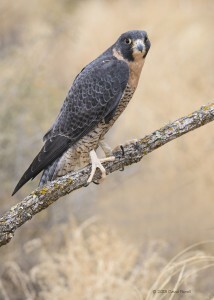 Peregrine Falcon. Image by David Powell. Bioaccumulation is the process in which the toxins in the environment are collected little by little by the organisms at the bottom of the food chain (i.e. plants, plant eating animals). As the toxin accumulates in the bodies of larger predators, it can reach lethal dosages within individuals. The top predators, those that never directly ingested the toxins, are affected by the indirect consumption of poisoned prey. The story of DDT is popular with this theme in our elementary school programs. Our educational Peregrine Falcon is often used for this lesson. Most students have never heard of DDT or about the endangerment of Peregrine Falcons, Bald Eagles, and the Osprey (or fish hawk). To demonstrate the bioaccumulation topic to today’s children, we play the bioaccumulation game. 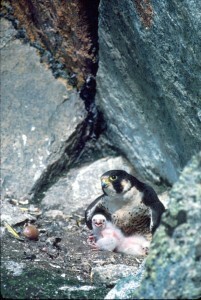 Peregrine Falcon with chicks. Image courtesy of the US Fish and Wildlife Service. pick up, or “eat”, the poker chip nutrients. When all of the poker chips are collected, the grasshoppers step outside the farm field and count how many red colored chips they have acquired. Students have to remember their number, and the grasshoppers return to the inside of the field. A smaller group of students are given larger cups, to represent their ‘sparrow stomach’. The grasshoppers are then preyed upon by the sparrows. The grasshoppers hop around to avoid being tagged by the walking sparrows. Once tagged, the grasshoppers empty the contents of their stomach into the sparrow’s stomach, and hop outside the field. Once all of the grasshoppers are eaten, the sparrows count how many red chips they have in their stomachs. The sparrow students step back into the field, and 2-3 students, representing the falcons, are given the largest cups. The falcons can run around the field, while the sparrows can only walk, trying to avoid getting eaten. When all of the sparrows have been eaten, the falcons count how many red chips they accumulated in their stomachs. At this time, we all gather to discuss what was really going on. The farmer is called back up, and is asked what he/she planted in the field. Do you want the grasshoppers to eat all your crops? What do you do to keep them away? The students easily answer, “Use poison!” At this point, I share with the students that the red poker chip they collected was the poison. If they had more than 10 chips, then they were poisoned and died. And, all of the falcons should have collected more than 10 red chips! We then talk about how many animals survived with a little poison, but that all of the falcons died with lots of poison. I ask students if they think this really could have happened, and they all agree that it probably did. From there, we ask students what they think we could do to stop grasshoppers from eating crops and what could be done to help falcons. The students come up with all types of answers, from more sparrows that eat the grasshoppers, to catching all the grasshoppers and feeding it to our kestrels.